We develop thoughtful, motivated and responsible young people with a global outlook. 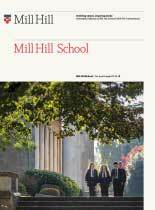 Our pupils are excited by the challenge of learning; we help them to thrive and find their own path to happiness and success through the range of opportunities presented by the Mill Hill School Foundation. To develop in all those who study and work here, moral integrity and the confidence to stand up for what you believe in. Being co-educational means that our pupils are used to different views and approaches, and never feel that they have to follow a particular path because of their gender. Developing social skills in an environment that reflects society, alongside embracing diversity of opinions, encourages our students to engage in a holistic approach to the world around them.